On June 14, 2016, Felix Sater was getting stressed about putting together Michael Cohen’s trip to St. Petersburg at which, on June 17, Donald Trump’s personal lawyer might meet Vladimir Putin, which would in turn lead to a $300 million real estate deal. He bugged Cohen in the morning to get back to him. 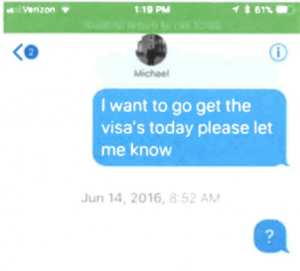 At 10:24 AM, Sater sent Cohen the invitation he would need to get a Russian visa in one day’s time. At around 11:35 AM, the Washington Post reported that Russian hackers had hacked the DNC. Things still seemed to be ready to go at 12:06 PM. 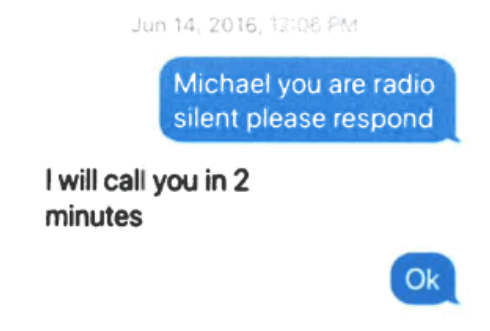 Sater texted Cohen, “you are radio silent, please respond.” Cohen called him just after noon. But by 2:41 PM, when Sater showed up at Trump Tower to get the paperwork, Cohen wouldn’t let him come upstairs. 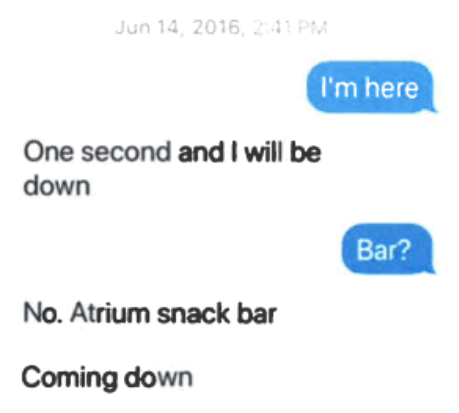 Instead, he met him downstairs in the snack bar. The final sentence of this graf from the WaPo story should have been comical at the time, given that Trump had decades of associations with Russia, but given what we know now is obvious journalistic malpractice. > Russian President Vladimir Putin has spoken favorably about Trump, who has called for better relations with Russia and expressed skepticism about NATO. But unlike Clinton, whom the Russians probably have long had in their spy sights, Trump has not been a politician for very long, so foreign agencies are playing catch-up, analysts say. Something tells me that Putin would have wanted a bit more backstory from Trump on why Cohen would not be traveling as planned. Is it my imagination or did these guys act as is if some Roy Cohn would appear as if by magic to solve all their troubles, and never once imagined that in the most watched election on the planet word might leak about some of what they were doing to win it? Nah. Putin just redoubled his efforts to make sure Trump was good and compromised. He’s an old hand at making sure the target is fucked. And yes, they were all, badly, out of their league. But that’s why they made easy marks. Marcy, any thoughts about where Felix Sater stands now in the investigation? He’s quite an iffy character for many reasons. I believe he has been working under a plea deal since early 2018, possibly as early as January 5. He’s working off being named a Russian spy though, so he has a lot of work to do. Same. I don’t see Sater having specific loyalties, except to himself. The Silk Road Group was involved in financing Trump’s Moscow Tower, while also being accused of smuggling weapons. 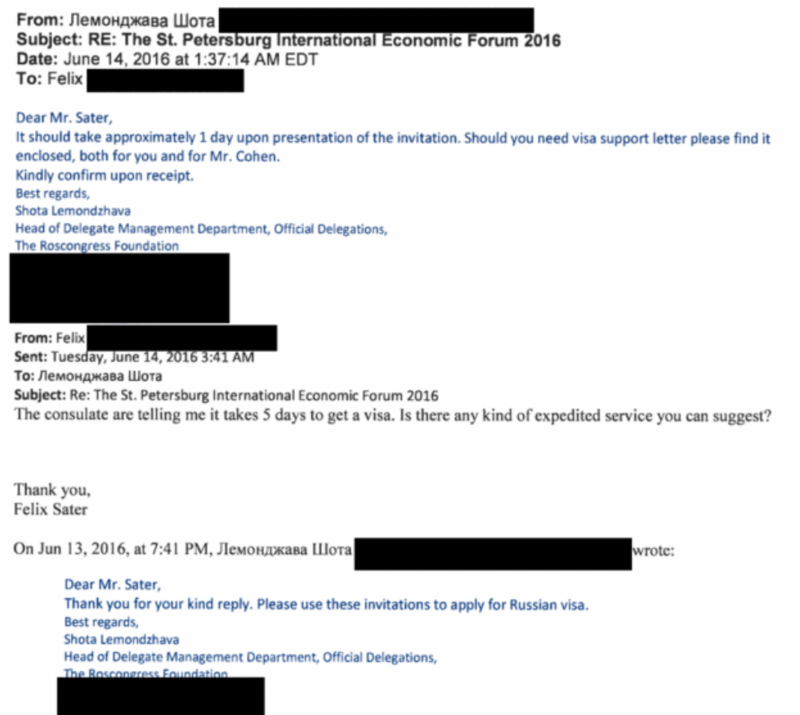 Sater hits that intersection nicely (since he previously got off, serving no time in exchange for reporting on the black market of arms). Worth rereading that and other EW posts at the time for insights. I agree that’s a hilarious sentence, although I’d say it extends past the journalist. Nakashima is a well sourced reporter and I don’t think she’s hacky in the way Judith Miller was. I think she was repeating the conventional wisdom provided to her by some set of mainstream analysts. She obviously should have known better, but I think that bit is also a sign of how dismissive the mainstream intelligence community was toward the Trump-Russia threat in mid 2016. Seeing how screwed up the media reaction to Trump-Russia is today, I’m very unsure we’ll do any better when the next unfamiliar issue bubbles up from the ooze. It also reads like something an editor might have dropped in at the end. Hillary was the US Secretary of State. The notion that the Russians only “probably” had her in their sights for intelligence purposes is laughable. There’s no “probably” about it, and the same goes for every US Secretary of State going back to Elihu Root if not William Seward or even Thomas Jefferson. I’m not sure that they were dismissive so much as disbelieving that his candidacy would go anywhere – that was about when it became obvious (to those of us paying some attention) that he was in with Russia. And it’s only gotten worse since then. Oh, I agree this seems like boilerplate conventional wisdom. It’s just another example of how our press, political parties, and public being on autopilot helped Trump to get into office and Russia to take advantage of our system. I think the underlying problem is that they were treating something that should have been assessed as a 20% chance as a 0% chance. It was something of the inverse failure of Cheney’s doctrine, which allegedly said if there is a 1% chance of something being an urgent threat, it needs to be treated as a 100% chance. I say allegedly because I don’t think Cheney ever seriously followed that, he just used it as a way to browbeat people to chase the issues he wanted to chase. Saters been a CI for the Feds for decades..
After June 9 the Russians could anticipate stomping in the mud puddle would splash an adequate amount of mud on Mr. Trump. Especially if Monafort was involved, as M was not careful and incredibly indebted to his handlers. Probably. Thanks again. aND JuST wHo iS THe KeePeR oF THe KeYs? So WH will try to spin this all Tower talk as just another example DTs incredibly ambitious, energetic captain-of -industry pre-presidency “business” elan? And try to steer prying eyes away from quid pro quo territory. And failing that he will be cast as only naively ‘duped’ by Putin – but that nothing ever affected policy etc? I doubt anyone trusts Sater’s cooperation. He’s sketchy but has been reliable when not selling out Russia. is that the same as sayin Felix Sater is reliable only when turning witness against lesser criminals he conspired with? Maybe I’m just cynical, but does anyone else wonder why the SDNY (who we know leaked lots of BS about HRC back in the day, with impunity) Feebs suddenly are deciding to put more effort into their independent investigations? If they weren’t already Ghouliani’s pals this wouldn’t be as much of an issue, but is it possible that their renewed interest is really to be a listening post for Noun-Verb-9/11 Rudy and by extension Kaiser Quisling? Asking for a friend investing in aluminum foil futures. The FBI is a big operation and I wouldn’t at all assume the entire NY group is Giuliani friendly. Mueller probably knows the ringleaders going back to his days as FBI Director, and if anyone is capable of riding herd to keep them out of the mix, it is Mueller. I’ll concur that Mueller would be the best of the options to “ride herd” on these guys IF he was in charge of them, but he is not in charge of SDNY at his OSC perch. The BDTS is their boss, instead, and I’m sure Kaiser Quisling and his Palace minions will use every lever to damage whatever case Mueller can bring. IIRC, isn’t Mueller also looking specifically at the inaugural committee (run by Pence and apparently where much of the money went missing), so why would SDNY need to interject themselves here unless someone important wants to call in some favors? SDNY is not the FBI’s NYC office. Creepy deposition video. Psycho/sociopath Trump talks Sater: “if he were sitting here I wouldn’t know what he looked like”. Trump says that about Barron, too. He only knows its him because that’s who Melania does hold hands with. I think this post clarifies in my mind why Trump frequently attacks Wachington Post and Jeff Bezos. From Trump perspective, Bezos caused him to loose lot of money and more. Bingo! That makes so much sense. Kind of looks like Mr. T. Hilarious if true. OT – Rayne, I’ve been thinking about your post on 1/28/19, Unwinding a Multithreaded Beast. You had a screen grab of the Daily Mail from 10/4/16. It had a long headline. The article allegedly was to celebrate an anniversary for Assange and/or WikiLeaks. You were asking what its real intent might be. I suggested it might be a signal or reassurance. Don’t know if anyone anywhere has suggested this. But I’m thinking Corsi (at Stone’s prodding) contacted Malloch in London and asked him to put this in the paper. The intent would be to signal Assange to release emails on Hillary to counter the Access Hollywood tape. No offense intended. I didn’t know where to put it. Should I have put it in that other post? It just popped into my head. My mind thinks in a collegial manner. I’m not trying to drive anything. Sincere apologies. thanks for asking that question. it is a subject i am very interested in. sater (and deripaksa) are two characters in this drama who drift, ghost-like, on-stage and off without ever seeming to be seriously caught in the web of conspiracy. but spying for the russ fed is sure as hell serious. thanks to ew for revealing that tidbit. p.s. 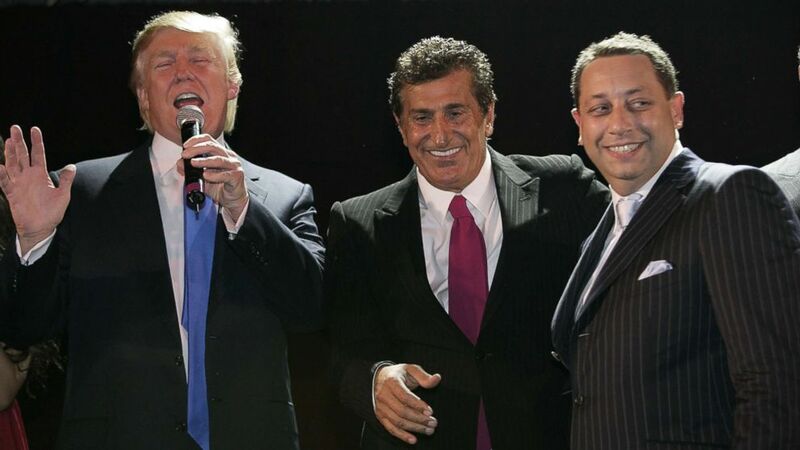 rayne posted a photo here a week or so ago of trump, sater, and tarif afik – birds of a feather. I don’t think I posted a picture, perhaps a link to a story about the three of them and their Bayrock connections. Russian government hackers penetrated the computer network of the Democratic National Committee and gained access to the entire database of opposition research on GOP presidential candidate Donald Trump, according to committee officials and security experts who responded to the breach. 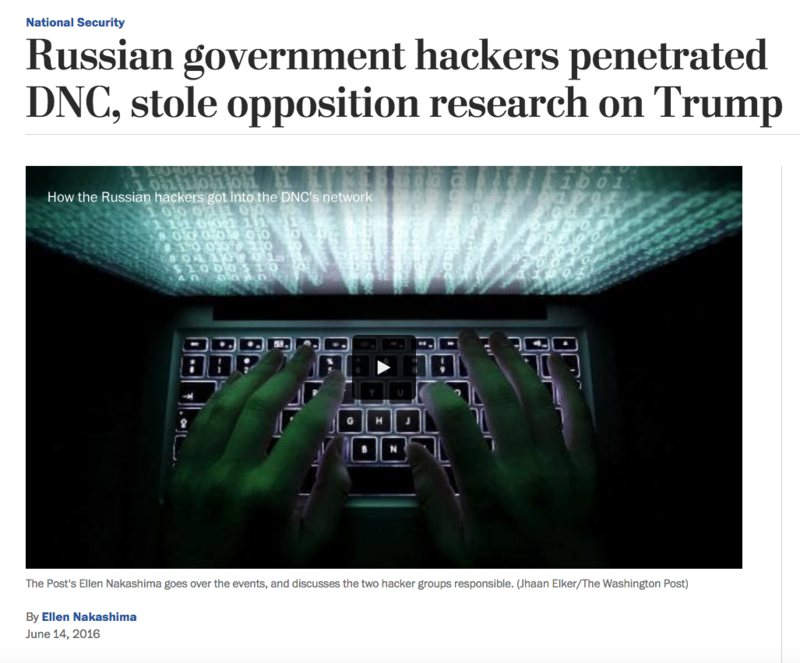 The intruders so thoroughly compromised the DNC’s system that they also were able to read all email and chat traffic, said DNC officials and the security experts. In another piece linked therein, I was also struck by the familiar non-specific DNI statements from May 2016, and how they compare to similar ones pre-midterms (tho RU-and others then-acknowledged as agents). And now the escalating hints about 2018 as ew has recently analyzed. The director of national intelligence on Wednesday said officials had seen signs of attempted cyberattacks on 2016 presidential campaigns. “We’ve already had some indications of that,” James R. Clapper Jr. said at a cyber-event at the Bipartisan Policy Center in Washington. He did not indicate whether the attempted intrusions were successful or whether they were by foreign or domestic hackers. Nor did he specify whether the websites or campaign networks of Democratic candidates Hillary Clinton and Bernie Sanders or Republican presumptive nominee Donald Trump were targeted. thanks, rayne. i remember your comment, but likely had that picture in my head from past views – it’s those suits, those mob suits, the ones roger stone jr. also loves to wear. So I read that the Twit in Chief mentioned the investigations…Talked about kids being precious and then flipping to bombs and killing people without taking a breath. I guess it was typical lunatic fare? Anyway, instead of listening to the fool, I watched a documentary on William Monroe Trotter (starting the NAACP and protests) at the time of (the Clansman) Birth of Nation film, while President Wilson was a supporter of white supremacy. 104 years and we got Wilson in the WH again. Hi Trip. I started to watch the “lunatic fare,” just could not do it. Instead I watched PBS “Tales from the Royal Bedchamber.” Insightful. P.S. I did not put up link because they end up being huge. Haven’t figure that out yet. Thanks very much Trip. I know how to paste; however sometimes when I clicked the link the picture goes large on the site. I was avoiding the largeness. I need Technology 101. Ha. There’s a better way to do it. I saw bmaz do it once, but I have no idea how the wizardry was accomplished, so I just break the link, to stop embedding. I’ve gotten so much mileage out of this today. Thank you both. This is exactly why they are desperate for any other date to be when the “Moscow Trump Tower” deal was put to bed. Once the DNC was hacked, the trip was no longer necessary. Maybe because Trump Tower Moscow was really code for Russian assistance in the election. Like adoptions was code for sanctions. When Trump warned Dems not to investigate him (again last nite) did he know already that “someone” in his orbit has a draw full of stuff like this? There is that purported $300 million Trump wanted from his Tower deal. The House committee is delaying Cohen’s testimony until the 28th. Since Mueller has raised the profile of the felony “lying to congress”, I am very interested in the potential of folks like Jeff Sessions to take a walk over to club fed. I’m hoping against hope that Mueller is gunna put the screws to those like Sessions who have thus far slithered out from under the rock on the other side of the hard place in this entire criminal enterprise. If Haldeman, Erlichman and Mitchell went down for Watergate (a”third rate burglary”) surely Trump’s attorney general has some exposure in conspiring against the US and lying to congress about it. On the flip side, I’m very interested in eventually finding out who avoided prosecution by giving full and illuminating testimony to Mueller instead of trying to weasel out of it. Out of Priebus, Spicer, Hicks, Bannon, McGahn, Kushner and I’m sure some I’m forgetting, odds are someone is singing. At least one of them was probably smart enough to know that cheap evasions or bluster was riskier than not trusting all other conspirators would keep to their cover stories. I’m curious who has handed over a big list of off the books email accounts or recordings of meetings — things more substantial than what we can guess Omarosa was able to witness. Maybe they were all fearless and cagey, but I wonder if there isn’t at least one key person who decided not to play games with Mueller. Yes indeed!! But if there is only one of the bastards who came clean that could be problematic…but if more than one saw the light then they’re all fucked and nobody even unzipped their pants. And the guy who wouldn’t pay it as a lump sum (he offered two payments of $10 million instead, and was turned down) tried to get tickets to the inauguration. I’d guess Priebus would talk. Maybe Spicer. The rest are still glued to Tr*mp. One thing I wonder about is whether prosecutors have used evidence of Flynn-style lies to the FBI or Manafort-style financial hanky panky to pressure people into more cooperation than they would otherwise have given. So far, we’ve seen major cooperation alongside indictments, as in Gates and Flynn, but I don’t know whether that is always going to be the case. If they had the goods on Bannon’s bathtub, for example, would they necessarily indict him to ensure cooperation, or are there other avenues they might take if there was, hypothetically, evidence of illegal bathtub use. I know deals get cut with witnesses in organized crime cases that don’t involve indictments, but I don’t know how applicable that would be in a case like this, or what factors prosecutors would consider if it was an option. Felix Sater Promised a Putin Meeting with Michael Cohen Minutes after Don Jr... Was Facebook Biased or Was It Manipulated?